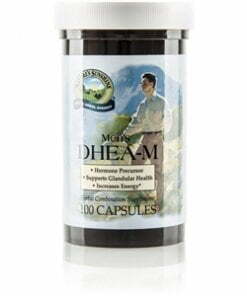 DHEA-M (for males) provides an essential hormone precursor to the body. Dehydroepiandrosterone, or DHEA, is produced by the adrenal gland, and, as the body ages, the adrenal gland decreases production which may play a role in the aging process. 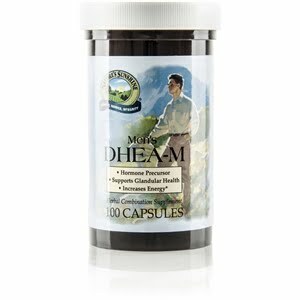 After DHEA is produced, it turns into hormones that are essential to many bodily functions. Nature’s Sunshine DHEA is combined with a herbal base of sarsaparilla, saw palmetto, damiana, pumpkin seed and panax ginseng. Each of these herbs provides key nutritional benefits to the male body. Saw palmetto nourishes the prostate, pumpkin seeds encourage proper reproductive health while sarsaparilla, damiana, and panax ginseng are all herbs that support male health. Cellulose (plant fiber), gelatin, water, magnesium stearate (vegetable), silicon dioxide (powdered silica), gelatin, and water .